This is reference to the conservation from which, we understand that your company (hereinafter referred to as “Client”) is now seeking legal supports in assigning capital contribution to a foreign investor. We further understand that after assignment of capital contribution, Client shall focus on distribution of construction materials. Under Vietnam Law, activity of distribution of good is classified to conditional business sectors. Then, upon a foreign investor involve with goods distribution in Vietnam by newly forming a foreign invested company or acquiring an existed pure local company shall be subject to approval from the competent authorities. Step 1: Obtain approval for assigning capital from pure local investor to foreign investor This is the prerequisite condition for starting the capital contribution assignment process between Foreign Investor and Local Investor. In this phase, Client and Foreign Investor shall propose with competent authority documents reflecting financial ability, experience and investment condition satisfaction of foreign investor under Vietnam together with the planned business activities of your Company after completing assignment process. Competent Authority shall base on explanation of applicants and relevant law to determine whether to approve such assignment or not. It shall take us about 20 working days from submission of application dossier to the competent authority for completing this step. Within 05 working days after obtaining approval letter for capital contribution assignment, Client shall apply for change of Certificate of Enterprise Registration for reflecting change of capital ownership. It shall take you about 07 working days from submission of application dossier for complete changing of Certificate of Enterprise Registration. Step 3: Obtaining Investment Registration Certificate Please note that, Vietnam Law is silent on whether Foreign Investor is required to obtain Investment Registration Certificate after acquiring an existed local company or not. However, in practice, regarding to the sector of goods distribution, we highly recommend Client to obtain Investment Registration Certificate. We anticipate that it shall take you about 20 working days from filing date of application dossier to obtain the Investment Registration Certificate. Step 4: Obtaining Business License After obtaining Investment Registration Certificate, Client shall be required to obtain Business License. It shall take you about 1,5 months from submission of application dossier to obtain Business License. 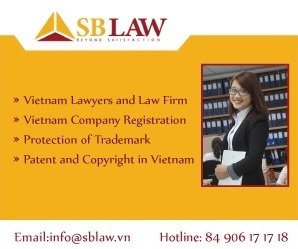 The Price for performing the SB Law services as mentioned in item above will be 6,800USD (Six thousand and eight hundred US Dollar). The above fee is exclusive of 10% VAT, governmental fee (if any) and cost for translating your documents from English into Vietnamese (10USD/150 words). Previous article Vetting of employment contract - your charges?